As you know, the two secrets to a good (Jewish) brisket are low — and slow. I cooked this one for about 5 hours last night on 300°. I let it cool overnight to let the fat get all congealed so I could scrape that part off. Then I sliced the meat, and arranged all the onions and sauce back on top. It will cook several more hours today on 200° and then I will warm the meat on the plata for a couple of hours tomorrow. This is the same recipe that I made for Rosh Hashana and we absolutely love it! Put all ingredients except for the onions and beef in the food processor and whirl together. Cut the onions into thick(ish) slices and layer the bottom of a roasting pan with them. Place beef on top and pour marinade over. Tightly cover with at least one layer of tinfoil and cook for forever. What are your favorite Shabbat splurges? Whether it’s calories or cost, what are your favorite recipes to make your Shabbat table special? P.S. I had a cooking marathon last night – forgot how much better it is to start Thursday night. Made Jamie Geller’s chocolate pretzel torte. It smelled delicious and looks beautiful, but it took about four times longer than the recipe said it would to cook. I hope it tastes okay! I will share the recipe soon, assuming it’s as good as it looks! Those look amazing! I can’t wait to hear how the torte tastes because I might have to make that one. My daughter might even forgive the chocolate with the pretzels there. It really is so tempting… but I’ll be good and wait ’til tomorrow! 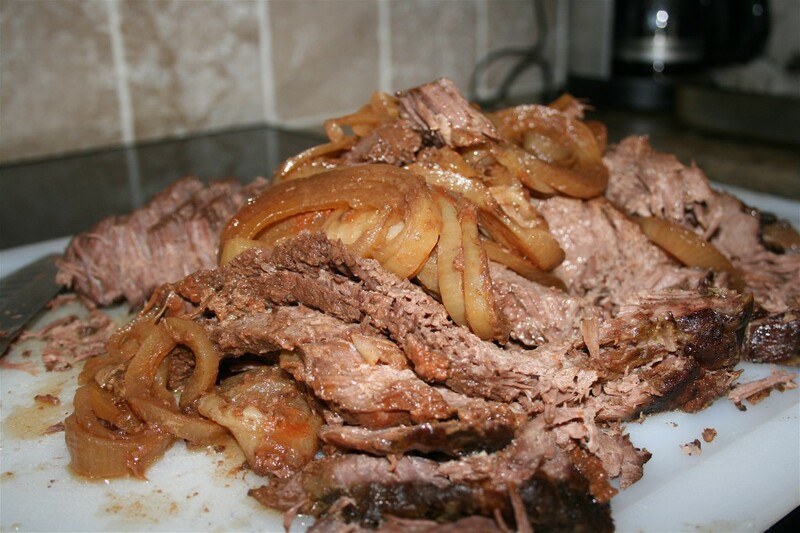 brisket is also my biggest splurge, and we have it a few times a year, for holidays or not….its always a special occasion when I announce that we’re having brisket. my go-to recipe is the Coke, Onion Soup and Chili Sauce plus onions and carrots. but when I want something with a bit more ‘personality’ and have a little more time to fuss with it, I make this: http://smittenkitchen.com/2010/01/southwestern-pulled-brisket/ and I make the slaw that she suggests as well. pretty much if she’s making it and says its good, I gather the ingredients and start cooking. I can’t count the number of times I recommend her site to people. have you made her honey cake? it is DIVINE! the mustard chicken she posted the other day sounds amazing…as long as you replace the heavy cream in the sauce. I don’t have a standard spluge, but recently I made a duck. It was about $25 for a four pound bird. I cooked it using this recipe: http://crockpot365.blogspot.com/2008/12/crockpot-peking-duck-recipe.html although I used a different plum sauce. It was gone in one meal (for two of us), although it probably would have lasted a little longer if we’d had more to eat with it then just bread. Ooh! This brisket looks great! Thanks for sharing and writing a wonderful blog! I have a similar recipe but I put it in the oven Friday night at 200. It’s perfect by lunch. I also have a recipe for brisket like that except I put it in the oven right before Shabbat on 200 and leave it till lunch. Comes out great! I make a Coca-Cola brisket that uses one bottle of chili sauce, 1/2 package of onion soup mix and one 12 ounce can of Coca-Cola. I modify it by adding either diced onions, carrots and celery to the bottom of the pan before placing the meat on top and pouring over the sauce, or sometimes it’s just diced onions (which melt into the sauce) and then baby carrots around the edges of the pan. I have made it for same day eating and it never tastes as good as cooking in advance, scraping the hard fat, slicing thin and reheating back in the gravy/sauce. Sounds good, Shari. And I totally agree about the cooling and reheating – so much better!